WhatsApp Messenger is an incredibly popular app for the iPhone, connecting over one billion active members around the world every day. It lets you send messages to your friends, or to groups of friends, over Wi-Fi or 4G, thereby saving on your phone bill (although you may still end up paying for the data if you go over your limit!). The sad thing is that the app is only available for iPhone. There isn’t one for the iPad or iPod touch. But don’t despair. In this tutorial, we show you how to use WhatsApp Messenger on the iPad (or iPod touch) using WhatsApp Web. This connects to the WhatsApp account on your iPhone and forwards the messages on to your iPad, allowing you to send and receive messages, pictures and videos. It’s not native WhatsApp on the iPad, but it’s the next best thing. Beyond this, developers have taken it upon themselves to wrap the WhatsApp Web functionality into a range of apps with varying features, including notifications. If you’re looking to access WhatsApp on your iPad via WhatsApp Web, there are two ways to do so: either via Safari, or a third-party app on the App Store. Step 2) Tap on the URL and swipe down to access the ‘top drawer’ of the favourites menu that appears when typing a web address. You should see an option that says ‘Load desktop site’ – tap it. The second limitation is that unlike when the service is used on a Mac or PC, notifications from web browsers aren’t supported on iOS and so you won’t receive notifications of incoming messages. Apart from that and a few small bugs, however, the service is pretty easy to use and a great alternative for most WhatsApp users. Admittedly, using WhatsApp Web via Safari on an iPad isn’t a great experience because it wasn’t designed with the iPad (or Safari, for that matter!) in mind. Developers realised there was a gap in the market for a great WhatsApp Web app for the iPad, and we’ve been seeing apps appear in the App Store ever since. So, if you’re looking for something a little more premium (some third-party apps offer notifications and more, but at a price) take a look at the likes of Messenger for WhatsApp and Chat for WhatsApp. We used to recommend Messenger+ for WhatsApp as the best available, but the app is no longer available to download in the UK. 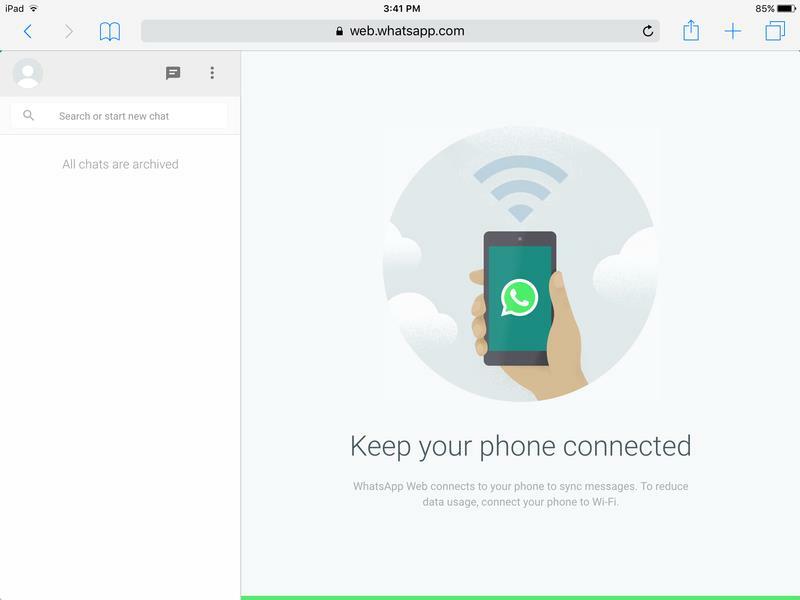 WhatsApp Web is a free and easy way to access WhatsApp on your iPad. Although you won’t get notifications (as you would when using the service on Mac or PC), it’s a great way of accessing your messages on tablet.